Tropical Cyclone Fakir was southeast of La Reunion Island in the Southern Indian Ocean when NASA's Aqua satellite passed overhead in space. Visible imagery from Aqua showed that wind shear was affecting Fakir. 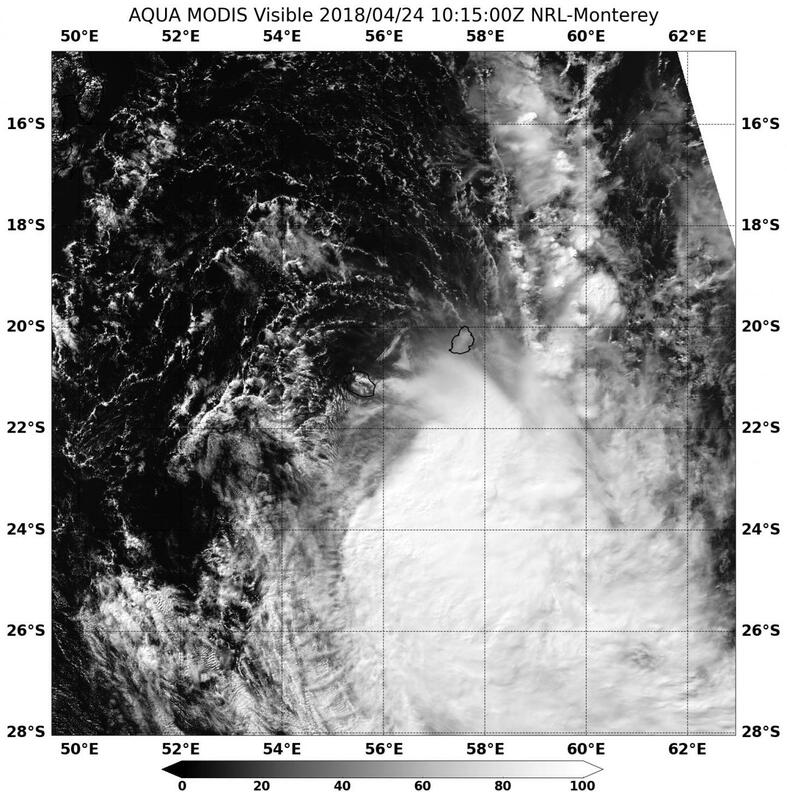 The Joint Typhoon Warning Center or JTWC noted on April 24 at 11 a.m. EDT (1500 UTC) that Fakir's center was located near 23.3 degrees south latitude and 57.5 degrees east longitude. That's approximately 162 nautical miles south of Port Louis, Mauritius. Fakir was moving to the south-southeast at 18 knots (20.7 mph/33.3 kph). Maximum sustained surface winds were estimated at 60 knots (69 mph /111 kph). The Moderate Resolution Imaging Spectroradiometer or MODIS instrument that flies aboard NASA's Aqua satellite captured a visible image of Fakir. The image showed a rapidly disintegrated system. The system appeared elongated as the bulk of clouds and thunderstorms were being pushed to the southeast of the center. Fakir was in an area of high vertical wind shear between 40 and 50 knots (46 to 57 mph/74 to 92 kph). JTWC noted that "[Fakir] is forecast to continue deteriorating due to the severe vertical wind shear associated with the trough (elongated area of low pressure) approaching from the west and cooling sea surface temperatures along its forecast track to the southeast. The unfavorable environment will lead to dissipation by [April 26].